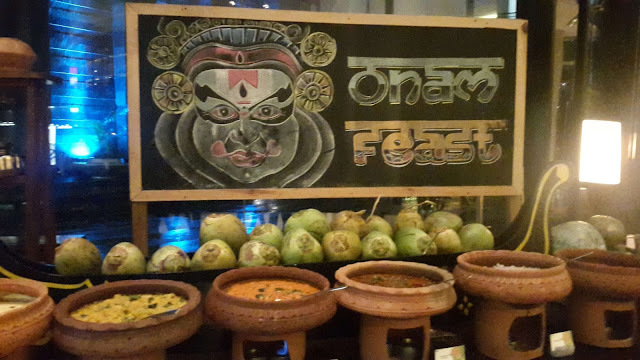 This year, Chef Thirumal curated a wonderful menu for the Onam Sadya to be celebrated at M Cafe, Marriott Hotel, Whitefield. 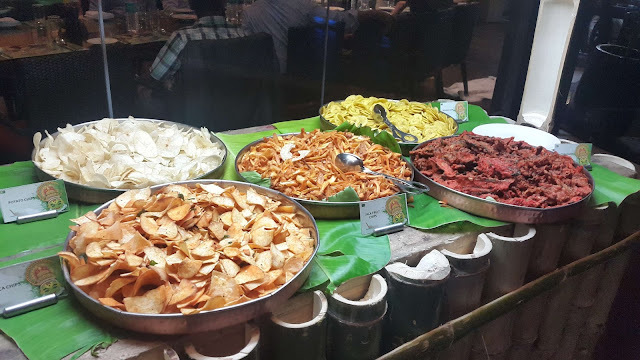 The festival had arrangements made for both spectra of the groups; the ones who wanted the traditional experience as well as those who wanted to be able to choose from a range displayed at the buffet counters. Voting to have the traditional experience, we were welcomed by the drum parade just outside M Cafe. 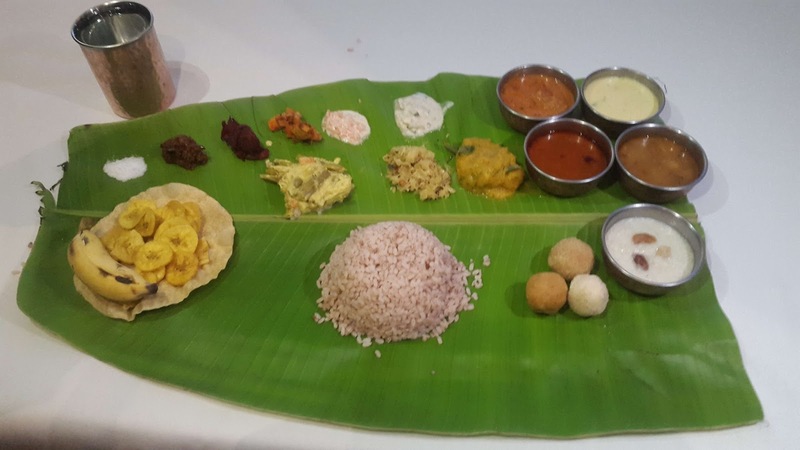 The food festival is characterised by a huge banana leaf serving as the plate as per Onam traditions. A variety of curries and pickles are brought out from the kitchen and placed on different parts of the leaf, like a royal feast. The meal consisted of more than 30 items including the non-vegetarian and special items being served at the buffet spread. We started off with the pickles - Injipuli, a dark brown ginger chutney with a zing, a green mango pickle, and a beetroot pickle. In addition to the pickles, we were served the traditional gravies - Sambar, Rasam, Avial, Thoran, Mathanga Erissery, Tomato curry and Raw Mango Pulissery. The Mathanga Pumpkin Erisserry was the best of the lot. The pumpkin dish was spicy with a hint of mustard, all the right flavours to get the senses tingling. The Pulisserry was another dish which fascinated me. A yogurt based gravy made with raw mangoes, the curry was quite sour. The feast was filled with dishes of contrasting taste and flavours, which made the meal even more exciting. The curries were to be had with the staple boiled rice as available in Kerala which is a much healthier alternative as compared to the general Basmati and Sona Masoori . It is fatter than the general rice grains, with a reddish hue. The menu also consisted Kerala cuisine favourites like Puttu and Kadla curry and Appam and Coconut Chutney. The Puttu is a cylinder of steamed rice flour layered with coconut. The way to eat a Puttu is to break and pound the steamed rice flour and then mix it with the Bengal gram Kadla curry. 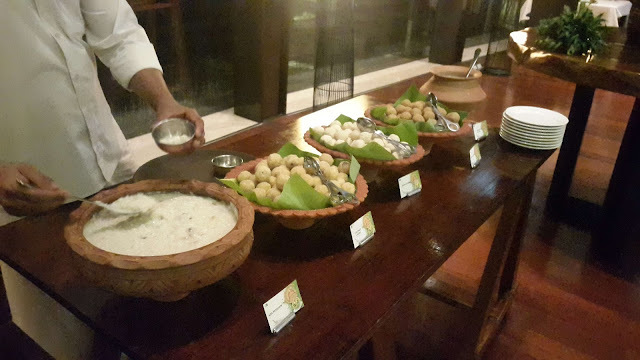 For desserts, we were served laddoos made of besan, rawa and roasted chana along with banana payasam.